Continuing our thread from yesterday on possible destinations for MSU's basketball team, today we take a look at the regional sites. Clearly, winding up in Indianapolis would be Michigan State's preference, given its proximity to East Lansing: It's just a hair longer than four hours' drive. 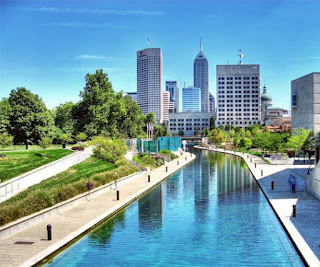 The town has been good to Sparty in years past - MSU's 2000 national championship victory took place in Indy's RCA Dome, as did the MSU women's epic Final Four victory over Tennessee. 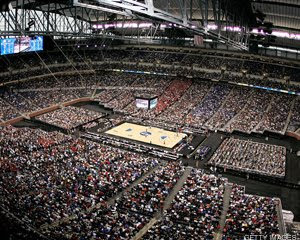 The stadium they'll be using this time, however, is the new Lucas Oil Stadium, which has its own plusses and minuses. On the positive side, it's brand new, got great amenities and all that. Not only that, it's sight lines were actually designed for basketball. There is one big drawback to the stadium, however. It wasn't designed to be a loud facility, thus any traveling Izzone impact would be muted, literally. Saturday's loss, which basically eliminated any chance of a 1 seed, actually helps MSU get closer to Indy. There's little chance Sparty would have leap-frogged Pittsburgh or Louisville, both of whom are seeking a Midwest Regional #1 berth. But there are fewer teams on the 2 or 3 seed lines that fit better in this city, so the odds are good State will land in Indy with two wins. The one possibility that could push MSU out is Memphis - they're hosting the Memphis regional and will thus get placed somewhere else. This is their natural landing spot as well, and the higher of the two between Memphis and MSU should be rewarded with a trip close to home. Chances of landing here: 80 percent. Of the non-Indy cities MSU could wind up in, I'm going to come right out and say that Memphis is the best landing spot. The drive, at about 11 hours, is doable in tandem or with 3-4 in a car. But flying here is just plain easy, considering Memphis International is a hub airport for Northwest. The trouble for State is that several other potential twos and threes - Duke, Oklahoma, Kansas, Missouri and LSU, just to name a few - would be much better geographic fits. That's why, even though this would be the second best possibility, it's also the least likely. Chances of landing here: Maybe 1 percent, but probably not even that. Glendale, on the other hand, is the exact reverse of Memphis. It's the worst possible option for Sparty, but the most likely for State outside of Indy. The reason for this is simple: There isn't a Pacific coast team that's a good option as a 1 or 2 seed. UCLA and Gonzaga, probably the best Pacific hopefuls, are projecting as four seeds, according to ESPN's Joe Lundardi. So that means someone's traveling. Other teams make better sense for every other region than MSU, which puts the committee in a bind. Do you make everyone travel just a bit, or do you instead make three teams happy and send one packing? Easy, you send one packing. And that one is most likely MSU. Chances of landing here: 15 percent. Aside from a love of the color green, Michigan State has practically nothing in common with Boston. There's not a huge alumni base there, plus it's a 13-hour (plus two border crossings) drive away. But the thing that could land Sparty in Boston is the same thing that could take them to Arizona: Relative proximity. UConn is an obvious choice for Boston, but aside from that, who do you put there? Every contender from the ACC would likely rather go elsewhere, as would Big East contenders Pitt and Louisville. So while there's no compelling reason to put State in Beantown, it could wind up there by default. Chances of landing here: 5 percent. By any criteria, this is the best possible site in America for a Michigan State Final Four team. It's not even close. Ford Field is an hour to an hour and a half drive from East Lansing. It's even closer for metro-Detroit alums, who (by far) make up the largest population of MSU boosters outside the Lansing area. Add to that the fact that many tickets were bought way in advance by fans on a whim figuring MSU might be there, and it all adds up to a big home field advantage. Of course, you have to get there first.